You know that feeling you get when you’re watching a horror movie and that eerie violin music starts playing? Have you ever wished a video game could make you feel that horrible anxiety the entire play-through? Well, then you might just want to try Five Nights at Freddy’s, a point-and-click survival game that retails for $5.49 on Steam (http://store.steampowered.com/app/319510/ ). There are also cell phone adaptations available for both Android and iPhones, though I have yet to play the game on either platform. 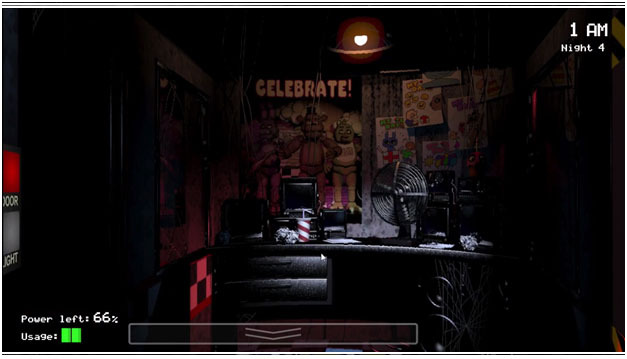 The concept of the game is fairly simple: you are the overnight security guard at a Chuck E. Cheese-esque family restaurant called Freddy Fazbear’s Pizza, but there’s a catch: the animatronics have a tendency to walk around at night. Worse still, if the animatronics see a human, they think of them as a robot not in costume and therefore “forcefully shove” them into a spare outfit, killing the non-robotic human in the process. So the player has to monitor the security cameras, the lights beside each entrance of the security room, and the door to ensure none of the murderous mascots get inside. Unfortunately, you only have a limited amount of battery life. And suddenly, you aren’t alone. The best part of the game is the high tension when you’re looking around your small room waiting for, and hoping to prevent, impending doom. 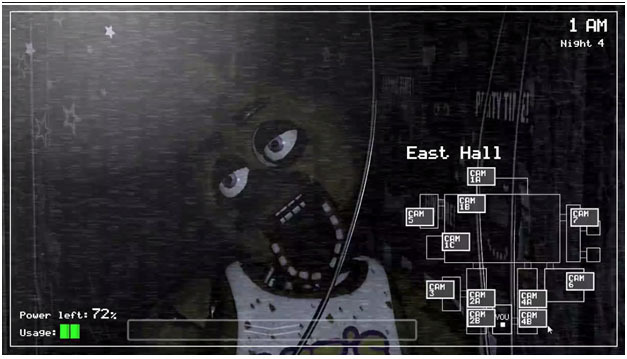 As the title of the game dictates, there are five nights, or levels, that you have to survive, with each successive night increasing in difficulty. There is also a sixth night that is unlocked after (if) you survive the original five. 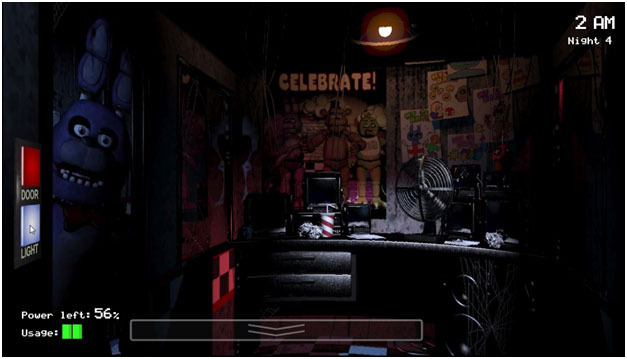 Once the sixth night has been accomplished, “Custom Night” is unlocked, where the player can adjust the difficulty levels of the AI. Each night has the same excruciating anxiety. The mood is set by the grainy camera, how the animatronics glitch on camera, the odd laughter that can be heard outside the halls, and the surprise of finding an animatronic standing right outside your door when you check the lights. All of this adds up to a great horror game that uses jump scares more effectively than most horror movies. Each of the animatronics (there are four, plus one spooky extra) is incredibly unnerving to look at, even when they aren’t hunting for human exoskeletons. For bonus creep factor, you can google theories surrounding the plot for Five Night at Freddy’s (let’s just say there’s a likely reason for the foul-smelling odour emanating from the animatronic suits). ← Who You Gonna Call?